All the classics. And then some. 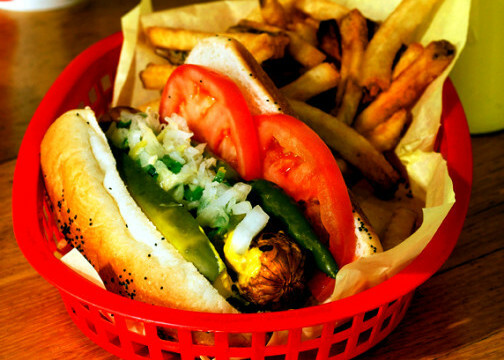 Mustard’s Last Stand serves up the classic Chicago style hot dog and Italian beef sandwich using only real Vienna Beef. We also went the extra mile to bring you a full range of delicious choices, using high-quality local suppliers whenever possible. Looking for vegetarian and gluten-free options? We’ve got those, too! If you made it this far, it must be because you want to try everything on the menu. That’s okay with us. Come in and we’ll be happy to serve you some food made with Chicago soul. Visit both out Denver and Boulder locations. Add Cheddar, Swiss or Provolone Cheese for only $0.85! This dog is twice as nice! Double the Vienna Beef than our regular dog, top this the way you want it. Little dog, big taste! We’ll serve it plain, or with ketchup and mustard. This is a big, juicy dog charbroiled on the grill. Top this tasty dog with any or all of our delicious condiments. Made from Vienna Beef’s century-old family recipe. Hardwood hickory smoking and a special spice blend make this sausage a winner. We serve ours on French bread, and you top this however you like—we suggest mustard, relish, onions, tomatoes, pickles, hot peppers and sauerkraut. This dog is topped with our delicious veggie chili. Make this fully loaded by adding cheese for an additional 0.75! 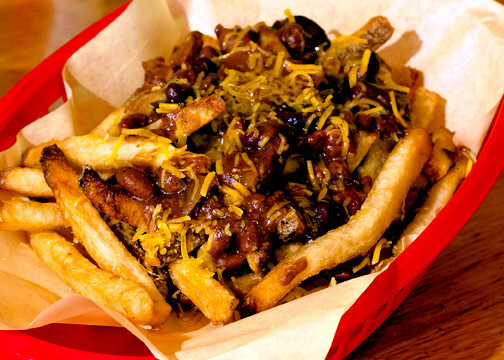 Cheese makes everything better–even our already amazing chili fries. Decadent? Absolutely! A Vienna Beef dog wrapped in corn bread—does it get any better? All-Natural Meat makes our beef and buffalo burgers taste better! Our 1/4 pound charbroiled burgers are made from local all natural, grass-fed, antibiotic- and hormone-free beef. 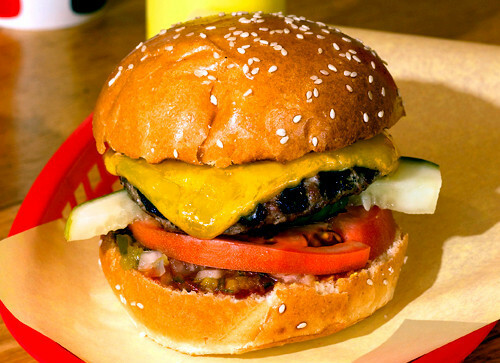 Top your burger with fresh tomato, pickles, ketchup and mustard. Double the beef is double delicious! These mini burgers are perfect for small appetites, but we bet you can’t eat just one, so why not grab a few and top them each differently? Yum! 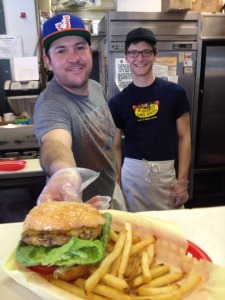 We Coloradans love our buffalo burgers! Ours are juicy and lean, and made from humanely-raised bison provided from Great Range Bison. We charbroil them to perfection, you top them the way you like! Double buffalo is double delicious! Just like momma would make! We take thinly-sliced roast beef and simmer it in a flavorful Italian-style gravy, then serve it on toasted French bread. Whaddya want on it? 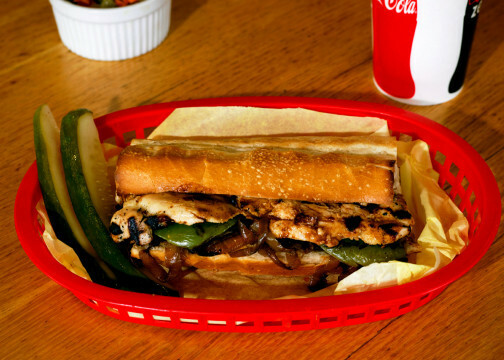 We suggest: cooked green peppers, giardiniera, hot peppers and grilled onions. We grill fresh Ahi tuna steak and put it on a hamburger bun. Top it with Swiss, cheddar or provolone cheese (for an additional 0.85) Whaddaya want on it? We suggest: lemon wedge, mayo, relish & onions. We charbroil our marinated chicken breast to seal in the juices. Top it with your choice of BBQ, Jamaican jerk, mango habanero or marinara sauce. Whaddya want on it? We suggest: green peppers & grilled onions. These juicy wursts are made with pork, beef, nonfat dry milk and spices. No nitrates here! Whaddya want on it? 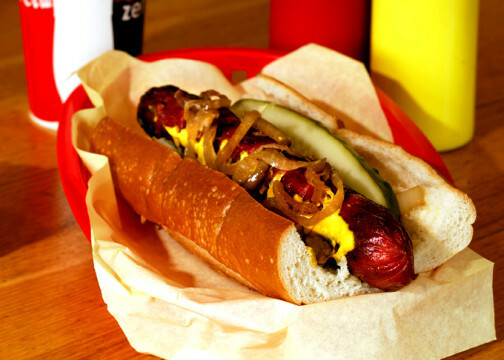 We suggest: hot Dusseldorf mustard, sauerkraut & grilled onions. You won’t miss the meat! 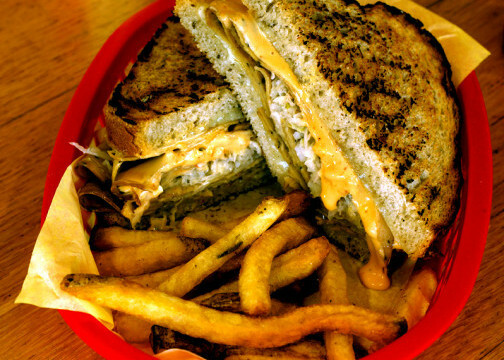 Sliced peppered tofu, brown mustard or reuben sauce and sauerkraut on grilled rye bread. Your choice of cheddar, Swiss or provolone cheeses topped with any of our condiments. How do you make your sandwich even better? Smother it in our veggie chili! We’ll bring Italian taste to the front range! 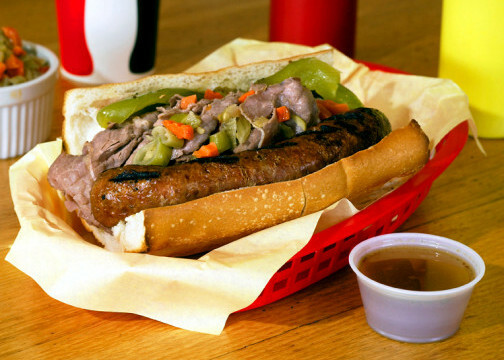 Our spicy Italian pork sausages are made by Steele’s Meats in Lafayette. We serve them on fresh French bread and you decide what you’d like to top them with. 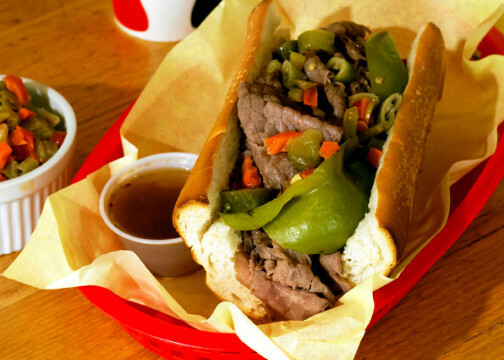 Can’t decide between our Italian Beef or our Italian Sausage sandwiches? Well you don’t have to! This sandwich has the best of both worlds. Delizioso! Taste the dog that PETA named as one of the TOP FIVE vegan dogs in the nation! 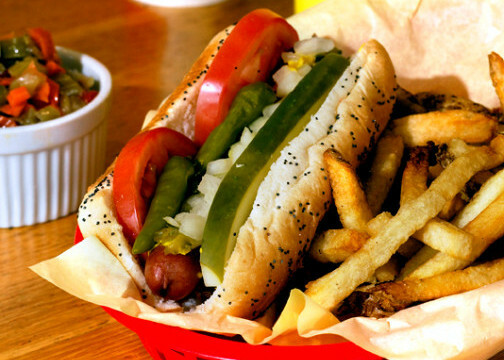 Make it Chicago-style or top it the way you like. Want a burger, but not the meat? Skip the processed soy patties and bite into a burger made of organic soybeans, organic brown rice and special spices made by Tofurky. Add a slice of cheese for an additional $0.75 or top it the way you like! Vegetarians and meat-eaters alike love our veggie chili. Enjoy a bowl, or add it to a dog or fries. Our homemade red chili is made with Mexican-style chili beans, pinto beans, kidney beans, stewed tomatoes, green peppers, onions and spices—not too spicy, but oh so delicious! We start with our hand-cut fries, smother them in our vegetarian chili and top them with shredded cheese for a filling side or meal in itself! Chocolate chip or oatmeal cookies from Breadworks Bakery in Boulder. These aren’t your average spuds! We start with real potatoes, hand-cut them, fry them in rice oil then season them with just the right amount of salt. 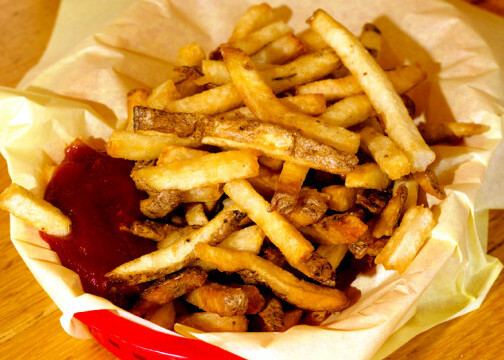 Whether you want just a taste of fries or a large portion, try them with one of our dipping sauces or top them with our veggie chili. Everything is better when you add bacon! Don’t eat gluten? Substitute Denver’s very own Udi’s gluten-free bread on any of our sandwiches. Coke, Diet Coke, Sprite, Root Beer, Ginger Ale, Iced Tea or Lemonade. Boulder soda prices are subject to an additional 2 cents per ounce sugar tax. Choose from Blue Sky Natural Soda flavors: Black Cherry, Cherry Vanilla Crème and Wild Raspberry. Boulder soda prices are subject to an additional 2 cents per ounce sugar tax. A selection of beers are available at the Boulder location only. Valid ID required. *These items may be served raw or undercooked, or contain raw or undercooked ingredients/ Consuming raw or undercooked meats, poultry, seafood, shellfish, or eggs may increase your risk of foodborne illness.